The 2008–09 Persian Gulf Cup (also known as Iran Pro League) was the 26th season of Iran's Football League and eighth as Iran Pro League since its establishment in 2001. Persepolis were the defending champions. 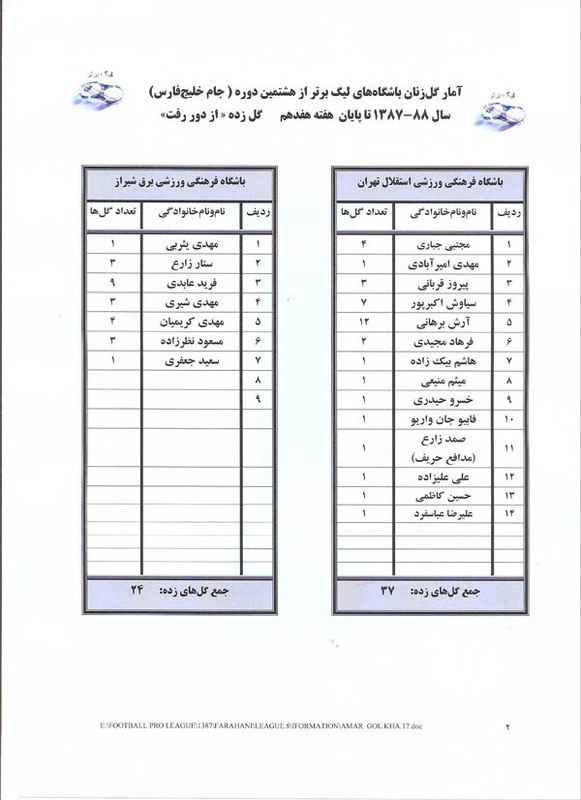 The season featured 15 teams from the 2007–08 Persian Gulf Cup and two new teams promoted from the 2007–08 Azadegan League: Payam Mashhad as champions and Foolad. Damash replaced Pegah. The league started on 4 August 2008 and ended on 26 April 2009. Esteghlal won the Pro League title for the second time in their history (total seventh Iranian title). In October 2008 Pegah Gilan terminated their sports activities due to financial problems. Damash Iranian (Damash Mineral Water Company) owned by Amir Abedini took over their license. New club named Damash Gilan. Below is the list of coaches who left their teams after the start of the season. ^ "Season: IPL2008-2009 Week: 10". Archived from the original on 2010-12-31. Retrieved 2011-04-01. ^ "Profile of Arash Borhani - IPL 2008-2009". Archived from the original on 2010-01-03. Retrieved 2011-04-01. ^ "Video of the goal". Archived from the original on 2011-09-28. Retrieved 2011-04-01.